I used 44% Cocoa Dark Chocolate since the people I was to share with don’t like the bitter taste (:roll:). Please use 55% or 70% Dark Cocoa chocolates to get more of the bitter flavor. Coffee powder has to be instant coffee/ freeze dry coffee powder you get which has to be only mixed in hot water/milk to be had. Do not use the coffee which requires the use of a filter. Chop up the chocolates. 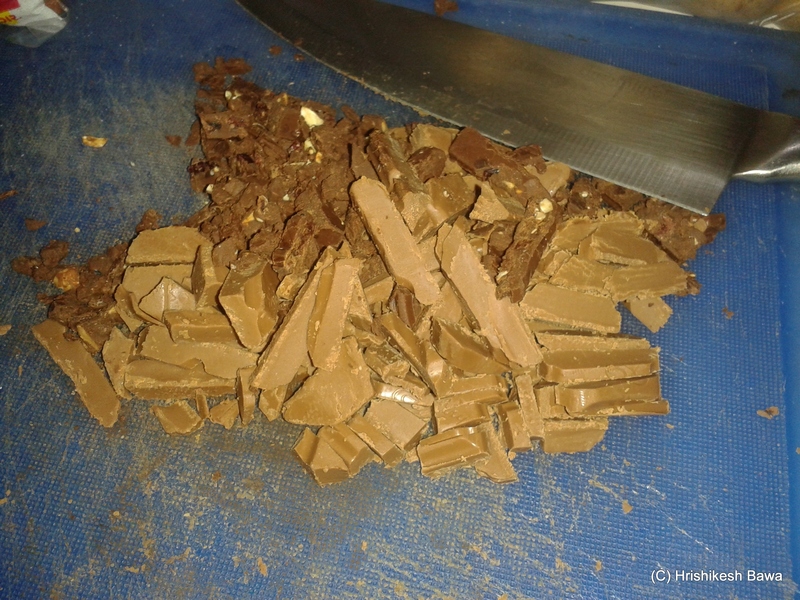 Mix the milk chocolate and dark chocolate slices. Melt these chocolate slices either in the microwave or on the gas using the double boiler method. Fill with water, and put on gas till water starts to boil. 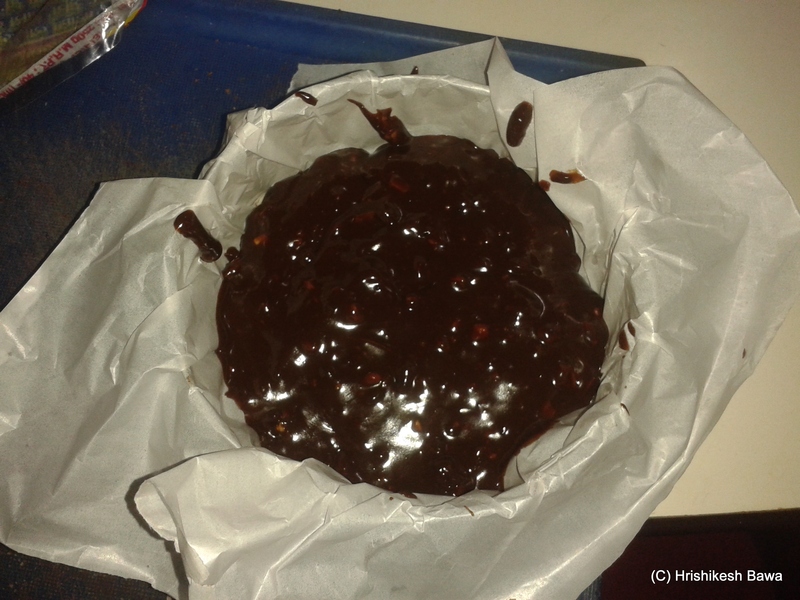 Place chocolates in a smaller bowl and place it inside the bowl with boiling water. Use a spatula/spoon to press and mix the chocolates till they melt. Do not expose the bowl with chocolates to direct heat. Take a bowl and place butter paper on it. Press the butter paper so that it takes the shape of the bowl. Ensure that there are no cuts or tears. Add the coffee powder and cream to the melted chocolate, and mix well. Optionally you can add a bit of ground cinnamon or hazel nuts. 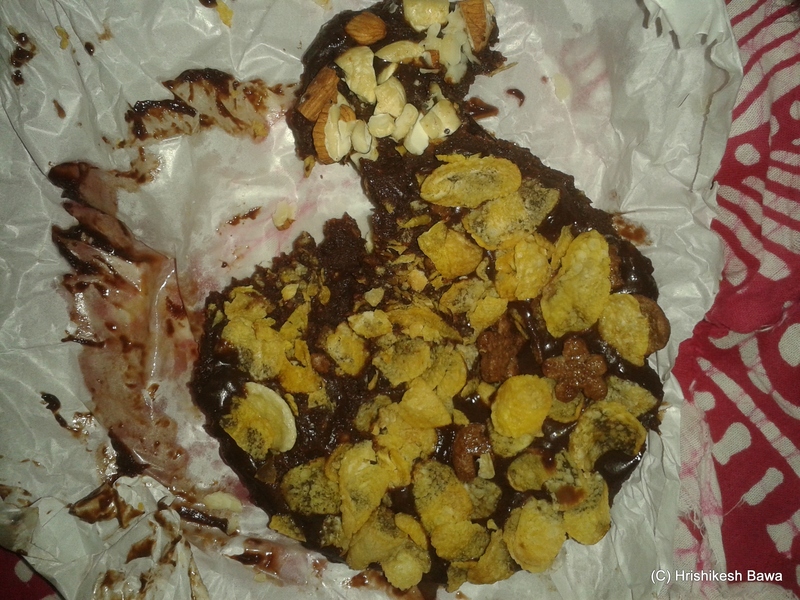 Pour the chocolate mixture on the nuts. We will keep the bottom layer crunchy with the nuts, and not mix them in the fudge. Sprinkle the corn flakes / cereal of choice on top of this. 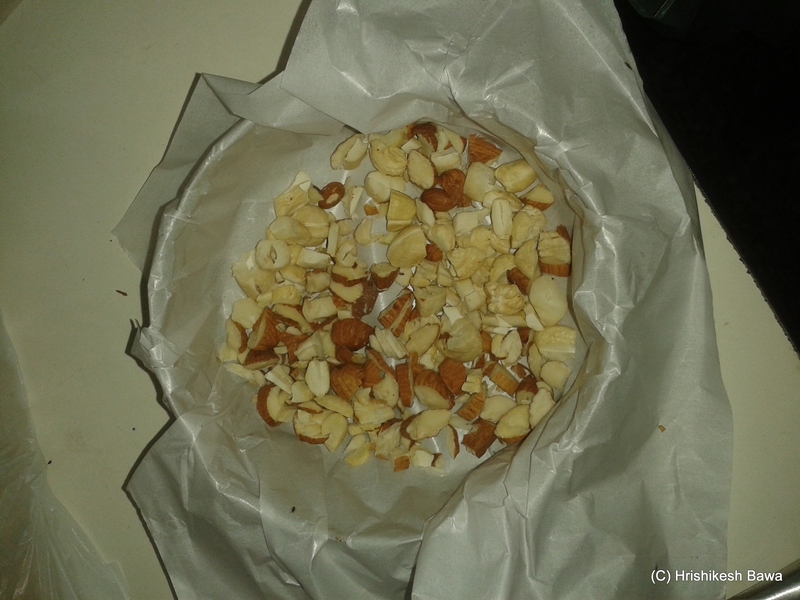 As with the nuts, we will not mix them into the chocolate mixture but keep them as a top layer. 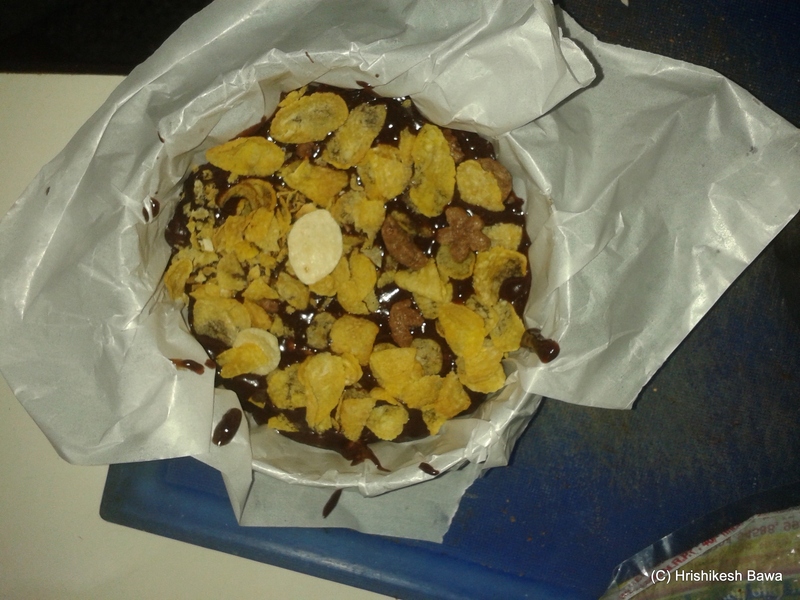 I mixed some Chocos along with my corn flakes for more flavor. Cover this with the excess butter paper or plate and let it set in the fridge for 5-6 hours. You can peel off the butter paper and cut it into cubes before serving, or use a spoon to eat it from the butter paper it self. Since it takes the form of a disc, I just break it off and eat it with my hands. Sounds yumm boy – n such a easy recipe too! Each step is explained in a proper manner. Thanks . That looks like a sinfully simple chocolatey recipe. I am gonna try this one. Thank you for posting the recipe and adding the finer details like the type of coffee powder and the % of cacao. I appreciate that kind of thoughtfulness in people. Since Christmas is just around the corner, this is definitely on my Christmas Baking. Its a good thing that I read this after eating a filling breakfast!! Good day very nice site!! Guy .. Excellent .. Wonderful .. I will bookmark your blog and take the feeds also�KI am satisfied to find a lot of helpful info here within the submit, we’d like develop extra techniques in this regard, thank you for sharing. . . . . .
Looks good. Easy to do too! Stand back, I am going to dive into this. Or am I late and all of it is gone?